Level VI and OEM Packaging FAQ - Icron Technologies Corp.
USB 2.0 RG2304 GE-LAN Adapter Technology Co Ltd.
24V with Locking DC Jack USB 3.0 SP3022 Adapter Technology Co Ltd.
VU5200 JP* Adapter Technology Co Ltd.
* The VU5100 and 5200 Japan SKU KVM extenders will have non-grounded power adapters because grounded electrical outlets are not common in Japan. 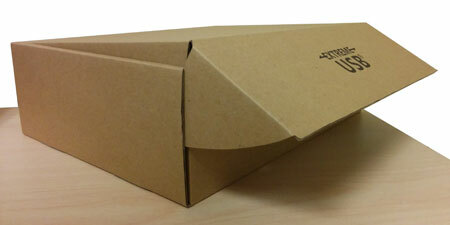 These extenders will be housed in an environmentally friendly brown box without any logo. The dimensions of the product boxes will not change from the existing box size. We encourage you to adopt the ExtremeUSB branding on your packaging to differentiate your product from lesser solutions, by choosing to add the ExtremeUSB logo on the front flap of your new product box. Figure 2 is an image of the new box, whereas Figure 3 and 4 show an image of the optional new product box with the ExtremeUSB logo. Please contact your Account Manager for more information about this packaging option. Q9. I am an OEM customer and my packaging is customized for my brand. How will this change impact me? All OEM products will transition to Level VI adapters (shipping February 3, 2016 for North American SKUs and will be a rolling change for other regions). In regards to packaging changes, please contact your Icron Account Manager or email pcn@icron.com and we will inform you of the exact packaging changes you will be seeing with your products. Q10. I purchase European/United Kingdom/Australian/Japanese extender SKUs. When will I see these changes? Q11. Is there a pricing difference in the products with the new Level VI adapters? Q12. Is Level VI the globally accepted energy efficiency level? Q13. Who is your Level VI power adapter supplier and where are the adapters made? Q14. Who do I contact if I have a question about the new Level VI adapter or the new packaging? Q15. Can I request non-North American SKUs to be shipped with the new Level VI adapters sooner? Q16. What is the part number, description and price for ordering the Level VI adapters individually? Q17. Did you make any changes to the ExtremeUSB extenders in order to comply to the new Level VI adapters? Q18. Are the existing Level V and new Level VI power adapters interchangeable? Q19. Do North American customers have to swap out existing Level V power adapters either in inventory or deployed with Level VI? Q20. What about Repairs/RMAs? How will they be impacted by the change?